I listen to a lot of music. I listen to music a lot. Both statements are true. Now that the stereo in the van is up and running again, I’m back to cruising around town with the radio on all the time. While NPR is still my No.1 (literally – my first preset), I do a lot of pop music in the car because it is either that or Country (because, let’s face it, I don’t always want my kids hearing the world news and I get sick of kid CDs after so long). Lately there is this song, apparently by Cash Cash, called “Take Me Home” that I keep hearing and it is driving me nuts. Truth? This post has very little to do with music. What it really centers on is what jogs through my brain when I hear this song (that has a beat and a chorus line clearly intended for a club or a dance floor, the thought of which makes me cringe). The second verse and the chorus are as follows: Round in circles/Here we go/With the highest highs/And the lowest lows/But no one shakes me like you do/My best mistake was you/You’re my sweet affliction/Cause you hurt me right/But you do it nice/Round in circles/Here we go/Oh Yeah/But I still stay cause your the only thing I know/So won’t you take, oh, won’t you take me home/Take me home, home, home. Fortunately, for me, only parts of these lyrics hit close to home with my past. Let me clarify: my association and bad vibe from this song have nothing to do with my husband. He’s the sunshine and roses at the end of this story; he’s the happy ending. But there was a relationship in my past that did send me around in circles, from high to low. And while I didn’t stay long, I stayed long enough to get really hurt and violated, which I’ll say more about in a bit. Before I do, I want to clarify also that I do not look back on this relationship with any sweetness or fond memories. I would never call it my best mistake and I would certainly never agree with the idea that someone could “hurt me right.” The ways in which I was hurt by this person were damaging. So damaging that it took me years to come to terms with what happened. To put the correct words and labels to my experience. To begin the healing process. But now I see both my experience and my reaction to it for what they were – not my fault and the only way I knew to keep going. Despite countless hours and emails and chats that allowed this male (calling him a man seems too gracious) to know me and my values, he took advantage of me. He crossed the line. He chose to sexually assault me. I was sexually assaulted. If those words are hard for you to read, imagine how shocking it was to me to say it to myself for the first time after I spent close to a decade telling myself I was responsible for what happened. That I put myself in proximity to him and was therefore at least partially to blame. But I’ve learned a thing or two about intentions since returning to my yoga practice and there is no doubt in my mind that I did not intend what happened. That was his choice. And now sexual assault is part of my story. But my story is also that I am a survivor. I did not stay with him. I did not pick another someone like him to marry. In fact, I picked the exact opposite of him for my forever. My husband is an amazing man who respects me and strives every day to be an honest and equal partner in this marriage. I know he will work tirelessly to help me raise boys who will not think it is OK to do to a girl what was done to me. And I know he will be an example to our daughter of what a good man is, so she will not get stuck in a relationship that violates her or compromises her values. My own dad is such a man and I am thankful for the example he provided me; I was able to keep going, even through Hell, until I found someone worthy of me and my love. Thanks to the great love I have in my life, in my marriage and from my family and friends, I am coming to terms with my past. I am learning that even though this is a part of me, it does not define me. The reason I am talking about it, and why that damn song annoys me so much, is that I want to encourage others to seek the help they need to face their own demons. I don’t care what ugly thing it is – a relationship, a secret, a trauma, a whatever. Find someone you trust who will listen, who will help. Find a good therapist (trust me; I’ve got a great one). Please don’t stay in your hurt just because it is the only thing you know. You deserve better. You can find better. You can get better. For me, part of the getting better is giving my experience a voice. By keeping quiet, I felt like I was letting the shame win. But sexual assault is real and it is awful and it is confusing, which is why it needs a voice. Not all attacks occur in dark alleys and not all attackers are strangers. Don’t stay with someone who violates you. Don’t stay with someone who doesn’t honor you. You have nothing to be ashamed of and neither do I. 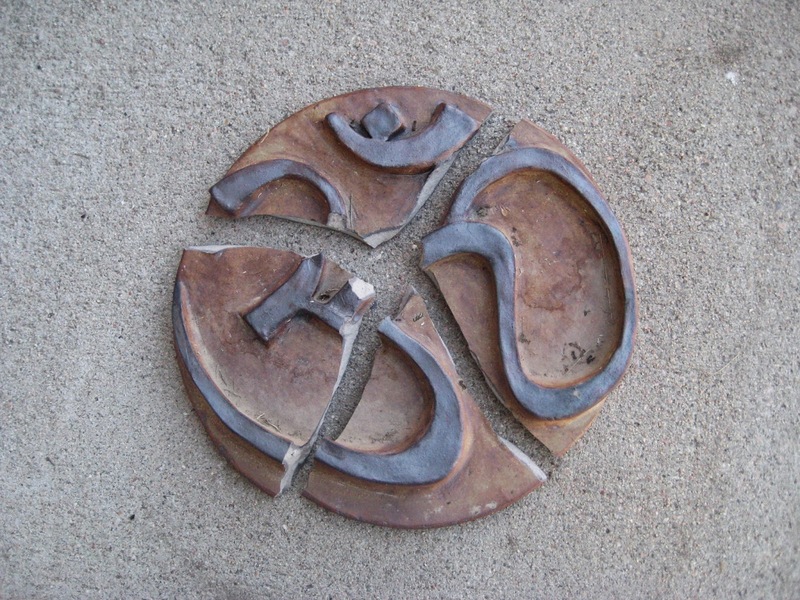 Even if your pieces and peace feel broken, you can find your center again. I am a survivor. You are, too. Also, April is Sexual Assault Awareness Month. To learn more about how to find your voice or help others find theirs, visit this website. By talking about sexual assault, we can work together to change the stigmas and stereotypes associated with it. If you have questions about what constitutes consent, watch this. If you need help in talking to someone who has been sexually assaulted, read here. As a way of adding my voice to an even larger conversation, I am participating in the Messy, Beautiful Warriors Project via Momastery. Glennon is a huge inspiration to me and I thought of her when I thought about posting my story. How fitting that she is encouraging writers and mamas (and warriors) to do exactly that this month. You can follow this image back to her blog to read the stories of other brave souls finding their way through this Messy Beautiful world. Next > Out of Words? Thank you for sharing your story. Very powerful and true. Thank you, Margaret. I appreciate you taking the time to read it! Thank you for the kind words, Sarah. Did you post to the MBW project, too? If so, will you please post a link?